It is often said that “familiarity breeds acceptance.” (At least 16,900 times.) I now have evidence to disprove this theory. 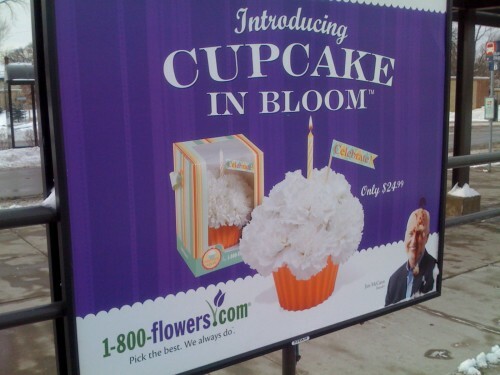 1-800-Flowers is heavily promoting a new product called Cupcake in Bloom via the ad boards at stations on the Hiawatha Line in Minneapolis. On the face of it this is a profoundly, fundamentally stupid product. Granted, I’m not big on flowers, but I do appreciate a nice arrangement. I do not, however, get too excited about an indiscriminate ball of white flowers, stuffed in a fake muffin wrapper. I would be deeply disappointed if someone I knew spent $25 on one of these for me. I would much rather have them spend one dollar on a real cupcake. I’m guessing I’m not alone in thinking this product is utterly stupid, which is why 1-800-Flowers is desperately trying to break down our resistance by placing at least five of these ads at nearly every station. On one side of the 38th Street station, for instance, there are eight ad panels. Presently six of these are displaying the Cupcake in Bloom ad. I didn’t even look at the opposite side of the platform to see how many more there might be. The only possible explanation for this marketing blitz is that the company is hoping that by saturating our visual field with this image, subjecting us to it again and again, we might just eventually get used to it enough to forget how stupid it is. Familiarity breeds acceptance. I was intending to take more photos (yes, there were at least two more of these signs at the station), but after these two I grew concerned that the Metro Transit panopticon was monitoring my activities: just as I took the second photo the prerecorded message about using the emergency phone to report suspicious activity came over the loudspeaker. Coincidence, perhaps, since they’re really pimping the emergency phone right now, but I didn’t want to test the response time of the Transit Police for something so stupid, especially since I doubt they would believe that this was the reason I was taking photos at the station.